Nothing tastes better than fresh! 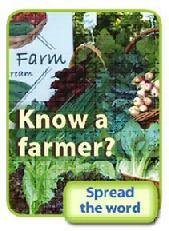 Have you heard of the USDA�s �Know Your Farmer, Know Your Food� program? It�s a federal program dedicated to supporting local, sustainable farmers. Even if you haven�t heard of it, there�s a good chance you�ve reaped the benefits � the program has done a lot to expand farmers markets across the country, help farmers sell fresh local produce to our schools, make it easier for low-income families to buy local produce, and a lot more. The bad news? The U.S. House has voted to eliminate the program entirely. Unless enough of us can persuade the Senate to reject the rollback, small farms could be left in the lurch. Environment America, an environmental group I support, is building a campaign to save the program. Already, thousands of people across the country have urged their senators to support local farmers by rejecting the rollback. But we have to get even more people on board if we�re going to convince the Senate.